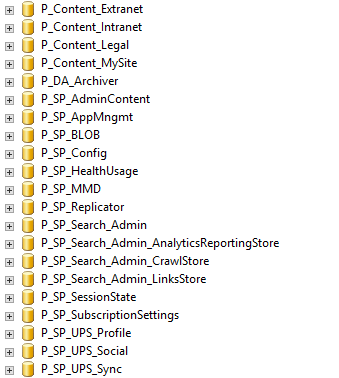 This is a prototype for a PowerShell script that monitors the status of each component of Search Service Application in SharePoint 2013. This script can be saved to a .ps1 file and run by the Window Task scheduler periodically. If it detects that any of the component is not in the “Active” state, it automatically sends an email to the administrator. #Declare variables for later use. #Create an empty array to store any component that is not active. #Loop through each component status, and store any one that is not active to the array. $unhealthy +=$number.ToString() + ". " + $_.name + "`n"
#If there is any component that is not active, send an email to the admin with the component name in the email body. The script has been tested with a single server farm with a single Search Service Application. If your scenario is different, you should adjust the script accordingly. #Define the function Enable-Auditing. The URL parameter accepts pipeline input. It also enables log trimming, and log retention time is set to 30 days. This part is kind of "hardcoded", but it should not be too difficult to change it. "All" to audit all auditable actions. An array of action names to enable auditing a specific set of actions to audit, e.g. "Update", "Delete", "Search". Enable-Auditing -URL https://teamsite.contoso.com -AuditedActions "Update", "Delete"
#The command below enables auditing Update and Delete actions on all Site Collections whose URL contains "hr". OK, if you are interested in my monologue discussing this function, please read on. Otherwise, the content above is all you need. How do you make sure auditing is enabled all the time? How may Site Collections do you need to manage? Does each Site Collection has its own Site Collection Administrator? Site Collection Administrators has the permission to change site audit settings. That’s a potential risk since they can intentionally or unintentionally change the audit settings, while auditing is usually an organization-wide policy that needs to be enforced. Sometimes, turning on unnecessary auditing is bad as well as it will make the content DB grow faster. A single piece of audit log is about 1KB. Imagine, 1000 people are visiting 100 locations in a day! In SharePoint Management Shell, there is no direct cmdlet for this purpose yet. We can define a function to make batch operations easier. To enable/disable auditing, the trick is to set the value of the SPSite.Audit.AuditFlags property. Based on tests, it accepts strings or array of strings. So there comes the code at the beginning of this post. How to hyperlink to a specific location on a long web page? The trick lies in the suffix “#ContentDB” in the URL. So the question this post is trying to answer is how to determine what to add to the end of the URL for navigating the users to a specific location on the webpage directly? We know in HTML we can assign an ID to a tag such as <p id=”something”></p>, which is the unique identifier of the this is specific element. You can then use this ID to locate the content to share. Not every element on a webpage has an ID attribute though. So having an ID is the prerequisite for locating the content directly. How to find the ID of the location you are sharing if any? There are two ways, the easy way and the hard way. The easy way exists when there are internal hyperlinks on a webpage, i.e. the hyperlink points to a location on the same page. In this case you can copy the hyperlink directly and share with others. For example, on TechNet articles, you constantly see hyperlinks to the same page. The hard way comes when there is no internal Hyperlink on the webpage. You will need to check the source code of the webpage for any ID that can be used. Task: Move search index from D: drive to E: drive on the existing Index Servers. #Discover current search topology information with documentation. #Define parameters for the move. $hostC = Get-SPEnterpriseSearchServiceInstance -Identity "Server3"
$hostD = Get-SPEnterpriseSearchServiceInstance -Identity "Server4"
$hostE = Get-SPEnterpriseSearchServiceInstance -Identity "Server5"
$hostF = Get-SPEnterpriseSearchServiceInstance -Identity "Server6"
#To the cloned topology, add new Index components using new path. #Set the new (cloned) topology as active. This step takes the most time. #Discover the component info in the new topology. #Confirm that all the components are ready. Also check in the Central Admin Site for the status. Remove the older index components. ONLY DO THIS AFTER NEWLY ADDED INDEX COMPONENTS ARE ACTIVE. You need to clone the latest topology and modify the new cloned topology. Then set the new clone as active when modification is done. Double Check in the InterimTopology.txt the info on the components to identify the components to remove. # Optionally, you can use a for loop to run through a list of components to remove. But I prefer the lines above as it shows explicitly the actual action to take. #Discover the component info in the final topology. DBAs hate the GUID appended to a database name. Everyone does! But that will happen if the farm and the Service Applications within are created with a wizard. Create a new databases with proper names and configuration. Move the sites with Move-SPSite PowerShell cmdlet to move the sites to the new databases. Verify the sites are working correctly after the move. 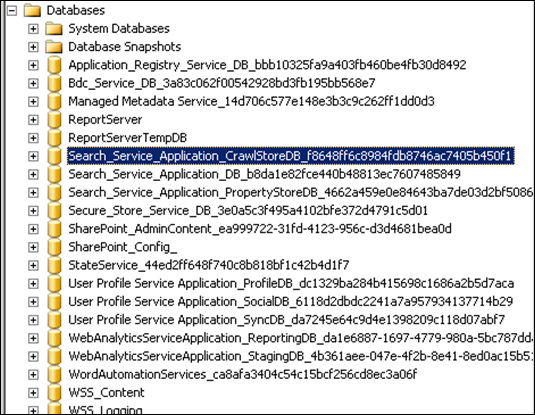 Dismount the database from SharePoint Web Applications with Dismount-SPContentDatabase PowerShell cmdlet. Rename the dismounted database in SQL Server with ALTER DATABASE T-SQL command or in the Object Explorer. Mount the renamed database to SharePoint Web Applications with Mount-SPContentDatabase PowerShell cmdlet. For Service Application databases, you need to rename the databases with additional actions and it is specific to each service application. Check this TechNet article to find information for the service applications you are using.